The Model 28A00-1 is a speaker and microphone assembly that allows two-way communication with a central station after an alarm, paging and listening from an on-premises or remote phone, annunciation of alarm and zone by voice, and voice messaging (not available on all systems) when connected to a Two-Way Voice Module. It may be used outdoors in weather protected areas. Do not mount speakers, microphones, 28A00 modules, or 33A00-4 consoles near any device that may produce noise (fans, air conditioning units, audio speakers, etc.). Microphones should be connected with 24 AWG or larger, shielded twisted pair wire. Wire length should not exceed 100 feet. Connect the cable shields and negative wires together at the Model 10A11-1, Rev B terminal block only. Do not connect the shield on the microphone end. Additional microphones can be connected to each input in parallel. Speakers should be connected with 18 AWG or larger, twisted pair wire. For wire runs that exceed 50 feet, use 16 AWG wire or larger. Wire length should not exceed 100 feet. Requires Two-Way Voice Module (HAI Part Number 10A11-1). 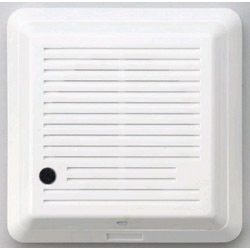 Works with Omni LT, Omni IIe, or Omni Pro II home control systems.